Watches are why I go outdoors. Not really...but watches like to breathe fresh air. Sunlight makes a watch's colors pop. Sunlight powers a watch's lumes. Sunlight makes silver-and-gold-colored hands and number markers sparkle. 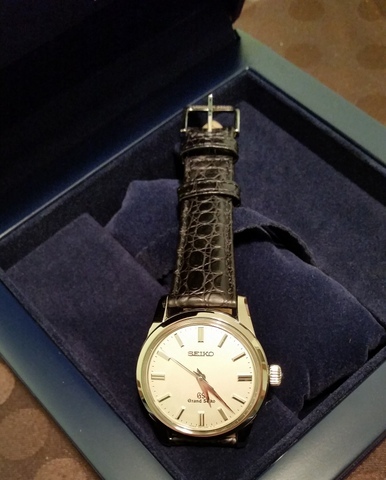 Watches look ten times more beautiful in sunlight than they do under the brightest indoor lights. The Zing pouch keeps your watch healthy. But not all sunny days last. Some become mean, with gray skies and, worse, rain that soaks you...and your watch. Diver and waterproof watches laugh at rain, but not all watches—including those with leather bands—are as amused. When the sky suddenly puts your watch at risk, your watch could seek shelter inside a Ziplock bag. But even better is the small, purple, neoprene Zing pouch. 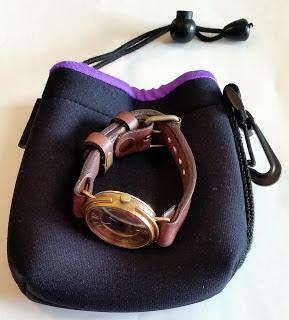 It's a waterproof, watch-size, kind-of-pretty, protective pouch that can keep your watch safe from unexpected bad weather including rain, hail storms, gales, and sandstorms (if you live in the part of the world where you have to worry about sandstorms). Why not use one of the many travel watch boxes that you can buy? Well, you could carry one, but the Zing pouch is lighter and compressible. You won't notice that you have it in your briefcase, backpack, or jacket pocket. The Zing neoprene pouch can also protect your watch when airport security insists that you remove it to put it through the x-ray machine. Just pop your wristwatch inside the pouch and pull the string tight; your watch will be fine when it arrives on the other side—no close encounters with keys or loose change. The small-size, compressible Zing pouch, which measures 1.5 x 5.6 x 6 inches, will fit almost all watches.